The long wait is over. The first episode of Her Money Matters Podcast is finally here! I have to confess, I’ve procrastinated this for a very long time, but finally things lined up and here we are! There is only so much I can bring writing a blog post, but with a podcast I can bring another dimension to the message I am sharing with you. Plus, I make improving your finances a fun and not such an overwhelming task. I’m not going to delay you anymore. Go ahead, press play and enjoy the show! I’d love to hear from you! What is one thing that you would most definitely like to hear on this show? Go ahead and share by scrolling down a bit and commenting below. Don’t be shy now! 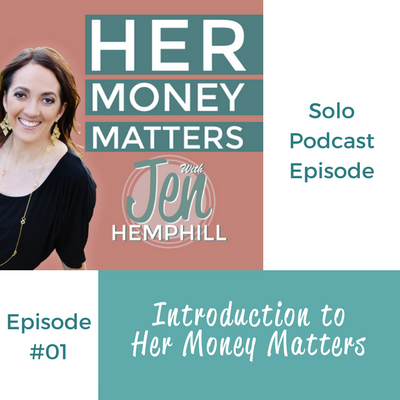 Jen Hemphill: Welcome to the Her Money Matters podcast! This is episode #1. I am so excited you are here with me. This is Jen Hemphill, Motivational Money Coach. I have to tell you this has been a long time coming up. Actually procrastinated a little too much about this. But I'm really, really grateful to have you listening to me no matter where you're at, whether you're taking a walk, driving somewhere, maybe brushing your teeth, you just never know, folding your laundry, whatever it may be, thank you. It really, really means a lot to have you here. So here’s what I’m going to talk about in this introductory episode. I'm going to give you the scoop about me. I'm going to tell you why I created this podcast. Who this podcast is for. What you can expect from this podcast. How to get the most value. And the number one thing I'm most excited about in being your host. So let's get the show on the road. So the scoop about me, I'm going to give you a traditional version and the more keeping it real version. So the traditional version is that I'm married, almost for 15 years I’m a mother of two boys. I am what's called an AFC an Accredited Financial Counselor which is different from a Certified Financial Planner. And I also consider myself a Motivational Money Coach and I have a chocolate lab, a very energetic one at that. And the more keeping it real version is (I have to be upfront with you) I am a little goofy. I say into silly things unintentionally. I make up words sometimes. I mispronounce things. And unlike comedians who have to come up with material mine just happens. Sometimes when I don't even want it to. Now not that I’m trying to be a comedian I'm just letting you know a little more of me so you know what to expect. And hey it could be entertaining for you. I also love absolutely love dancing so much so that I've considered trying out for the show So You Think You Can Dance. But, unfortunately, I have not been able to do that. They have an age limit. I just don't get that. But I also love photography. I actually went to school for it got a degree in photography and added it to my other two degrees which I'm currently not put into use. I have a slight addiction to the gym and nutrition but I excel more at the gym because I have my moments and when I do a little bit of chocolate overload you won't believe to the extent of what I do for chocolate sometimes. Ah, we won’t go there right now. We’ll just leave that one alone. I also love my jeans so much that I'm super picky about the fit and I will spend a good dime on a pair. But hey I feel glad if you’ve got to feel good to be confident, right? So that's my defense on that. I do love shoes like many women, but I do dread wearing high heels. Cause remember my comment about being goofy? We’ll just leave that at that. And I've been banned from singing at my house, unfortunately. But have been known to call especially one particular friend shout out to Amber in the car (hands-free of course) when I'm really feeling the need to sing a song. Sometimes I don’t know if you get that, I do. And, fortunately, I have good friends that will listen to my beautiful voice. And I almost forgot I do love coffee. God I have my coffee I was raised on it and maybe it has something to do with me being born in Colombia, just saying. So now it’s time to get a little bit serious. So why this podcast? And why do I call it Her Money Matters? Basically and essentially I want to help you to take to the overwhelm and guilt out of money and make you more confident. This overwhelming guilt is what really complicates and fogs out our vision when we think about money. And once we’re able to throw this overwhelming guilt to the curb we’re able to deal with our money more easily and more effectively. has to be stressful. I believe money can be simple and I'm going to show you that. And it doesn't matter if you are in charge of the bills or not you still need to be in the know. So maybe you are the one after the bills or maybe you’re just or maybe your spouse is, right? But if your spouse is in charge of the bills you need to have an idea of the financial picture. It will help tremendously not just in the communication with your spouse but also in your whole financial picture. And I called this podcast Her Money Matters because money does matter to women. And we'll be discussing money topics that are important that matter to women in a personal and relatable way. So think about it, unless you are a financial planner or trader or something of that sort you probably don't go to Morningstar first thing in the morning just to read up on the highest performing stocks and so forth. And you don't necessarily read that magazine Money. So that's why I wanted to create this podcast so you can have something to listen to that is not so daunting and not so stuffy. So who is this podcast for? If you haven't figured it out. It is for women, but men, if you are listening you, are more than welcome to listen. I am definitely not going to ban you from doing so. It is intended for the busy woman who just frankly doesn't have time for her finances but does have getting the money to organize on top of the priority list but just as filled with overwhelmed and guilt. So what can you expect in this podcast? You can expect weekly episodes that are released every Thursday. And I'm also going to give you simple actions from time to time that you can take around your finances. So I'm going to challenge you with that. I'm also going to provide you motivation and inspiration and boost your confidence. That's really a huge, huge goal of mine. And yes you'll definitely hear me like today just talking solo to give you some great money talk in a non- stuffy way and a fun way. I do keep things super simple. I'll also give you a sneak peek on my life from time to time because I'll show you my money wins, past experiences, my challenges because I'll go ahead and tell you I'm not perfect. And I also will be inviting ladies from all over just to share their amazing money stories. This can include too but not limited to getting out of debt and these are really meant to inspire you and let you know that you aren't alone. And it's also meant to continue them on the money talks so just won't be so taboo. Alright? story that you want to share or suggestions for future podcast show, please don't hesitate to send an email to me and you can email that to support@jenhemphill.com. So, how can you get the most value? I know you are busy. So how can you get the most value when you're listening to this Podcast? One is you want to listen when you're doing without doing other things that really need your full attention. So yes, when you're driving it's fine to listen to. Or going for a walk or you're doing chores. Those mindless tasks that don't really need all your brain power that's okay. Because it's not really going to prohibit you from really truly listening. But other things such as if you're taking care of your kids or you're helping kids with your homework that's really not a good time to listen to the podcast. You definitely want to focus on your kids and family first. Right? And you also want to put what you learn into action, not into the later part. I mean think about those times that you had all the intention to put something into action and you didn't. We've all been guilty of that, right? So take what you've learned and what you like because you may not like in everything, who knows. But take what you really learn and what you like and what really resonates you. And I challenge you to go ahead and put it into action. And you also get inspiration from guests I'll be featuring in the show. Because there's going to be people from time to time. There's something about their story that really you connect with and that you really resonate with. So you will definitely have that. And you can send me an email I will respond to you. I am a real person, I will respond to you. Comment on the website, just engage on there because you're not alone in this, alright? Yes, money is a personal matter but we can learn so much more when we engage and talk with each other. So don't be shy to comment on the website, alright? So the number one thing I'm most excited about in being your host is learning so I can better serve you. My really my big mission yes it's going to be fun for me learning lots of stuff. But really my bigger mission is how can I better serve you, alright? I know I don't know at all. Yes I have experience and yes I've have had successes but with your questions, your comments, and the featured guests I know that I'll be able to serve you so much better. Now I want to give a little shout out real quick because I have to tell you about a recent client, her name is Lauren, and she's when she called me first when we first talked she was really, really stressed and overwhelmed. I mean it was very evident about the money and she's made such a huge shift. And I'm just really so happy for you. Now I'm not going to say it's all because of my coaching, of course, yes I have helped but she herself have taken the action and done the work which in turn has allowed her to make the shift and she's when I talk to her heard from her last she just is so much happier the stress and just that frustration that she had the guilt has lessened so much. So Lauren congratulations! I'm so happy that you made so much progress and I'm looking forward to you meeting on the rest of your goals. Now I want to give you a little action step for today for the first episode. So, in the show notes in which you can find on the website and I'll share with you how in a little bit I'd like for you to tell me one thing that you would most definitely like to hear on the show by going to the comment section just below show notes for this episode. So just one thing and it would be so much help is really helpful if you're very, very specific so maybe you want to know more about budgeting don't just put I want to show about budgeting what is it specifically that maybe drives you nuts or frustrates you about budgeting. So really be specific on what you want to hear so that way I can really, really address that. Alright? zero-one. Until next time, you take care and thanks again for listening. Chao! I would love a really clear step-wise approach to getting money healthy. This is all totally made up, but I am totally Type A and love to follow steps. I’d also love a when you complete all these steps, this is what you need to do to maintain this…. Hi Leah! I’ve been thinking of you, I’ll send you a private message. Anyways, thanks for your comment. I will definitely consider that for my an upcoming episode, thank you! We have to cover the type A’s because I am one too :-). I can’t believe I just now listened to this!!!!!!!!!!!!!!!!!! It has been way to long since you have called me busted out in song!!!!! So proud of you Jennifer love you!!!!! Haha Amber, yes why did it take you so long :-). Brand new to the podcast thanks to a friend referring and what I am most interested in learning about is investing (and I am sure within all the already broadcast podcasts, it’s there) – understanding my 401k and the choices I have had made for me (from a trusted reliable source) – what to monitor, what to change, etc. in order to maximize.